Numerous cells are able to ingest foreign materials, but the ability to increase this activity in response to opsonization by antibody and/or complement, so as to acquire antigen specificity, is restricted to cells of the myeloid series, principally polymorphs, monocytes and macrophages; these are sometimes termed ‘professional’ phagocytes. Apart from some variations in their content of lysosomal enzymes, all these cells use essentially similar mechanisms to phagocytose foreign objects, consisting of a sequence of attachment (Figure 1. top), endocytosis or ingestion (Figure 1. center) and digestion (Figure 1. bottom). In the figure this process is shown for a typical bacterium. In general, bacteria with capsules are not phagocytosed unless opsonized, whereas many non-capsulated ones do not require this. There are certain differences between phagocytic cells; e.g. polymorphs are very short-lived (hours or days) and often die in the process of phagocytosis, while macrophages, which lack some of the more destructive enzymes, usually survive to phagocytose again. Also, macrophages can actively secrete some of their enzymes, e.g. lysozyme. There are surprisingly large species differences in the proportions of the various lysosomal enzymes. Several of the steps in phagocytosis shown in the figure may be specifically defective for genetic reasons, as well as being actively inhibited by particular microorganisms. In either case the result is a failure to eliminate microorganisms or foreign material properly, leading to chronic infection and/or chronic inflammation. Figure 1. Phagocytosis and intracellular destruction of microbes. Phagocytosis is an active, energy-dependent process of engulfment of large particles (>0.5 μm in diameter) into vesicles. Phagocytic vesicles fuse with lysosomes, where the ingested particles are destroyed. In this way, the mechanisms of killing, which could potentially injure the phagocyte, are isolated from the rest of the cell. Neutrophils and macrophages express receptors that specifically recognize microbes, and binding of microbes to these receptors is the first step in phagocytosis. Some of these receptors are pattern recognition receptors, including C-type lectins and scavenger receptors. Phagocytes also have high-affinity receptors for certain opsonins, including antibody molecules, complement proteins, and plasma lectins; these receptors are critical for phagocytosis of many different microbes that are coated with the opsonins. Once a microbe or particle binds to receptors on a phagocyte, the plasma membrane in the region of the receptors begins to redistribute and extends a cup-shaped projection around the microbe. When the protruding membrane cup extends beyond the diameter of the particle, the top of the cup closes over and pinches off the interior of the cup to form an inside-out intracellular vesicle. This vesicle, called a phagosome, contains the ingested foreign particle, and it breaks away from the plasma membrane. The cell surface receptors also deliver activating signals that stimulate the microbicidal activities of phagocytes. Phagocytosed microbes are destroyed, as described next; at the same time, peptides are generated from microbial proteins and presented to T lymphocytes to initiate adaptive immune responses. Pattern-recognition receptors: Phagocytic cells have surface and phagosomal receptors that recognize complementary molecular structures on the surface of common pathogens. Binding between pathogens and these receptors activates intracellular killing and digestion, as well as the release of many inflammatory chemokines and cytokines. C3 receptor: Phagocytic cells (and some lymphocytes) can bind C3b, produced from C3 by activation by bacteria, etc., either directly or via antibody. Fc receptor: Phagocytic cells (and some lymphocytes, platelets, etc.) can bind the Fc portion of antibody, especially of the IgG class. Binding of several IgG molecules to Fc receptors on macrophages or polymorphs triggers receptor activation, and activates phagocytosis and microbial killing. Opsonization: This refers to the promotion or enhancement of attachment via the C3 or Fc receptor. Discovered by Almroth Wright and made famous by G.B. Shaw in The Doctor’s Dilemma, opsonization is probably the single most important process by which antibody helps to overcome infections, particularly bacterial. Phagosome: A vacuole formed by the internalization of surface membrane along with an attached particle. The phagosome often fuses with the lysosome, thus exposing the internalized microorganism to the destructive power of the lysosomal enzymes or cathepsins. However, some pathogens (e.g. some species of Salmonella) have evolved ways to avoid phagolysosome fusion, and thus survive within the phagocyte unharmed. Lysosome: A membrane-bound package of hydrolytic enzymes usually active at acid pH (e.g. acid phosphatase, DNAase). Lysosomes are found in almost all cells, and are vehicles for secretion as well as digestion. They are prominent in macrophages and polymorphs, which also have separate vesicles containing lysozyme and other enzymes; together with lysosomes these constitute the granules whose staining patterns characterize the various types of polymorph (neutrophil, basophil, eosinophil). Phagolysosome: A vacuole formed by the fusion of a phagosome and lysosome(s), in which microorganisms are killed and digested. The pH is tightly controlled, and varies between different phagocytes, presumably so as to maximize the activity of different types of lysosomal enzymes. Activated neutrophils and macrophages kill phagocytosed microbes by the action of microbicidal molecules in phagolysosomes. Fusion of phagocytic vacuoles (phagosomes) with lysosomes results in the formation of phagolysosomes, where most of the microbicidal mechanisms are concentrated. Three classes of microbicidal molecules are known to be the most important. Activated macrophages and neutrophils convert molecular oxygen into reactive oxygen species (ROS), which are highly reactive oxidizing agents that destroy microbes (and other cells). In addition to ROS, macrophages produce reactive nitrogen species, mainly nitric oxide (NO), by the action of an enzyme called inducible nitric oxide synthase (iNOS). Activated neutrophils and macrophages produce several proteolytic enzymes in the phagolysosomes that function to destroy microbes. One of the important enzymes in neutrophils is elastase, a broad-spectrum serine protease known to be required for killing many types of bacteria. Another important enzyme is cathepsin G. Mouse gene knockout studies have confirmed the essential requirement for these enzymes in phagocyte killing of bacteria. 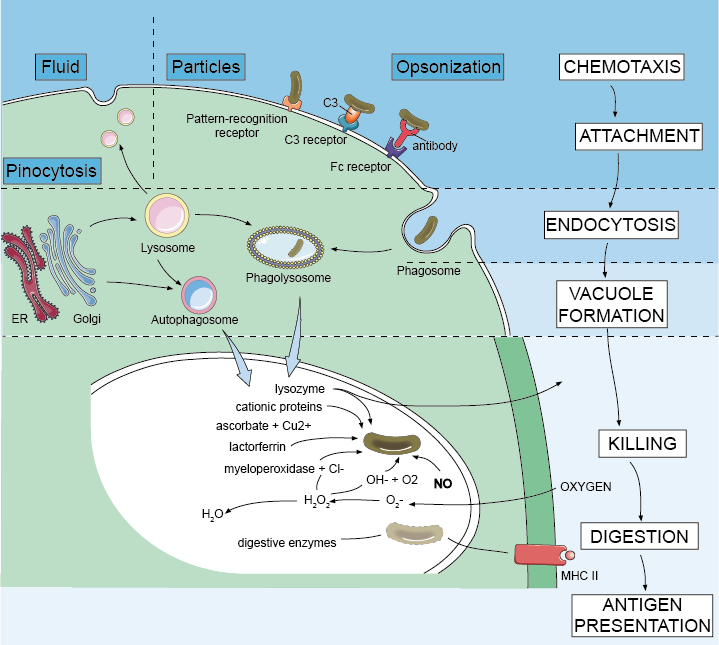 Oxygen and the oxygen burst: Intracellular killing of many bacteria requires the uptake of oxygen by the phagocytic cell, i.e. it is ‘aerobic’. Through a series of enzyme reactions including NADPH oxidase and superoxide dismutase (SOD), this oxygen is progressively reduced to superoxide (O2−), hydrogen peroxide (H2O2), hydroxyl ions (OH−) and singlet oxygen (1O2). These reactive oxygen species (ROS) are rapidly removed by cellular enzymes such as catalase and glutathione peroxidase. ROS are highly toxic to many microorganisms but excessive ROS production may contribute to damage to host tissues, e.g. blood vessels in arteriosclerosis. NO: Nitric oxide produced from arginine is another reactive oxygencontaining compound that is highly toxic to microorganisms when produced in large amounts by activated mouse macrophages; its importance in human remains less well established. In contrast, much lower levels of nitric oxide are produced constitutively by endothelial cells, and have a key role in the regulation of blood vessel tone. Myeloperoxidase: An important enzyme of PMNs that converts hydrogen peroxide and halide (e.g. chloride) ions into the microbicide hypochlorous acid (bleach). Reaction of antigens with hypochlorous acid may also enhance their recognition by T lymphocytes. Lysozyme (muramidase): This lyses many saprophytes (e.g. Micrococcus lysodeicticus) and some pathogenic bacteria damaged by antibody and/or complement. It is a major secretory product of macrophages, present in the blood at levels of micrograms per milliliter. Digestive enzymes: The enzymes by which lysosomes are usually identified, such as acid phosphatase, lipase, elastase, β-glucuronidase and the cathepsins, some of which are thought to be important in antigen processing via the MHC class II pathway.